A small exhibit doesn't mean it has to have a small impact. Create a high end look with a very low price. 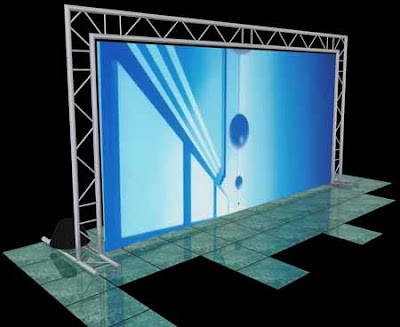 Insert a projection screen or a flashy large graphic and surround it with lighting truss from DisplaysExhibits.com. This unit in a 10 x 10 version is under a $1000 and can be shipped in just 2 boxes via UPS or FedEx. Call us today at 888-804-0042 to find out more information or email us at Info@DisplaysExhibits.com.